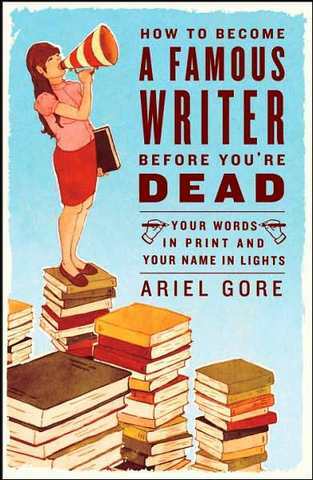 I’m going back to one of my go-to books when it comes to both writing inspiration and self-promotion ideas: Ariel Gore’s How to Become a Famous Writer Before You’re Dead. This book is both fun to read and full of great tips for making yourself a “famous writer” (a relative term, for sure) — equal parts famous and writer. Her very first tip is: “Write.” It seems obvious, and yet for many it isn’t. As I wrote in a post last week, I don’t believe in writer’s block because I don’t understand why you’d call yourself a writer if you have nothing to say. I mean, I get the idea of temporary writer’s block, once you’ve earned the title of “writer” by writing something. I certainly understand that one could write a bestseller and then find the pressure to produce rather crushing. But I also think the cure for writer’s block is to write. It doesn’t have to be a masterpiece. I’m writing right now. At least now I can call myself a writer. I’ll be working on the “famous” part in the weeks to come. I’m feeling a bit overwhelmed by my obsessive urge to set up reading dates in various cities for my two books through July. But it’s coming together, and I’m going to try to calm down about it (soon). I probably would’ve gotten this damn flu anyway, but stressing about all of this certainly isn’t helping my health. Gore’s book has helped me through other rough patches before — so much so that I’ve given it as a calm-down gift to fellow writers. I’m sure it will get me through this one, too.